This fire table has a round granite top and features a sun burner. 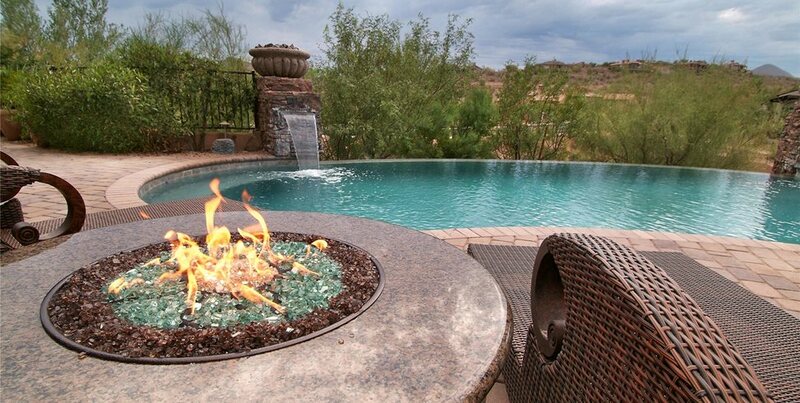 The elegance burner creates a traditional fire pit feel. Shown here is the square Tuscan Travertine fire table. We all love restaurants like Chipotle and Pick Up Stix. They have the convenience of fast food, but with better quality and atmosphere, making them a great option between a drive-thru and sit down restaurant. 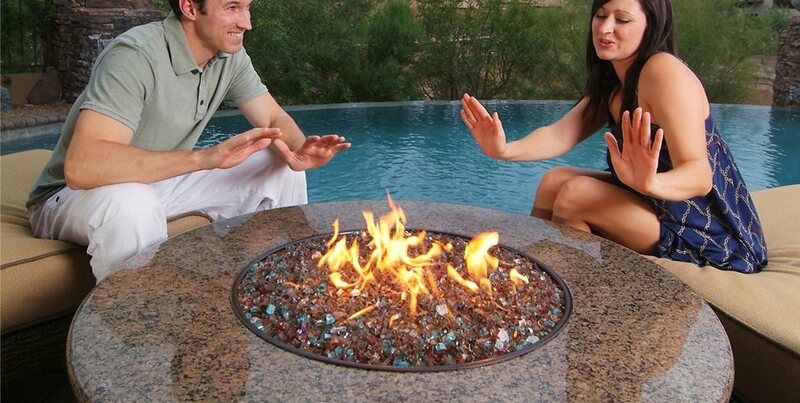 The makers of the Oriflamme fire table are taking a similar approach to outdoor living. 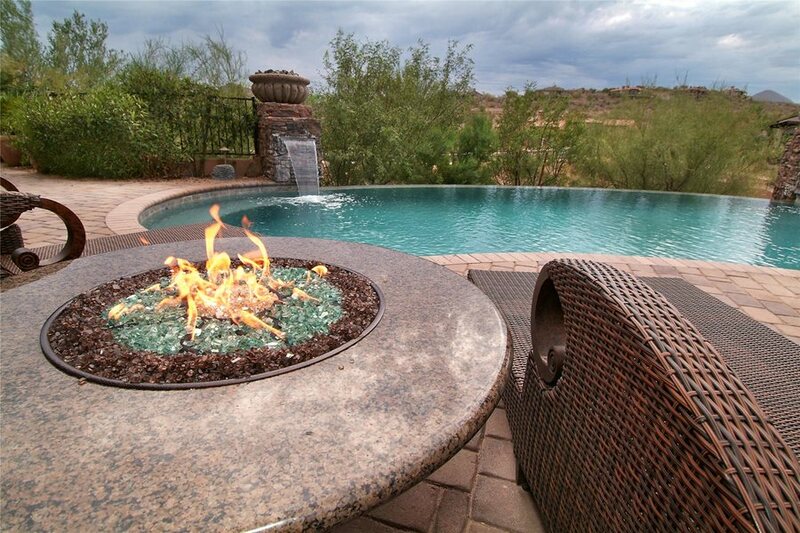 Oriflamme fire tables from Designing Fire are the perfect solution for someone who wants more than an off-the-shelf option, but isn't ready for a custom-built masonry fire pit. 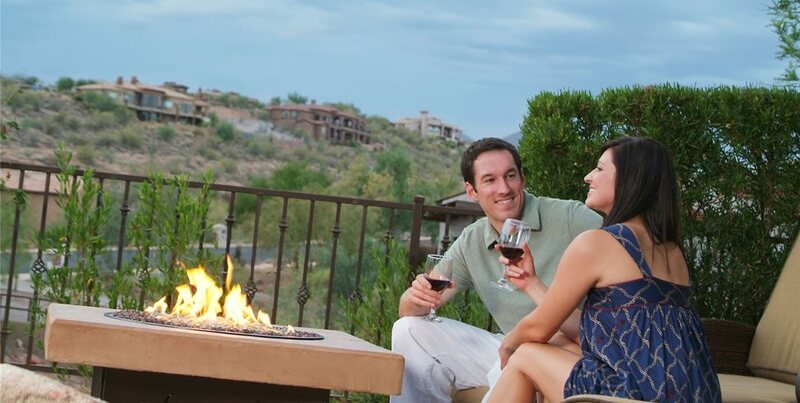 With the design your own approach, you can pick and choose the components of your fire table to match the style of your home or your outdoor furniture. The end result will serve as a centerpiece for your outdoor living area and provide you with the ideal social experience. There are two things that set Oriflamme fire tables apart. First, the table sits at nineteen inches, which is standard coffee table height. This is the optimal position for feeling the most real heat. 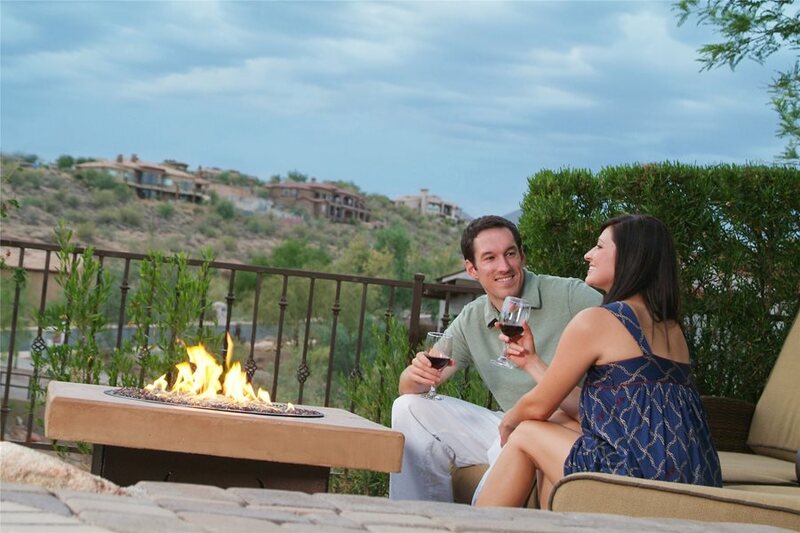 Fire pits that are taller are less efficient at keeping you warm. Second, Oriflamme Fire Tables offer unique burner designs that can't be found anywhere else. You'll enjoy watching the fire burn in unique shapes. According to Heikke Nielsen, Director of Sales and Marketing for Designing Fire, the most popular burner designs are Elegance and Sun. The Elegance burner creates a random flame and produces the traditional fire pit feeling that many people are looking for. While the Sun burner is a unique design that has a universal appeal. Furthermore, Nielsen points out that you can pay homage to your favorite sports team or display your company logo, by selecting the elegance burner and using multiple colors of fire glass to create a unique graphic. 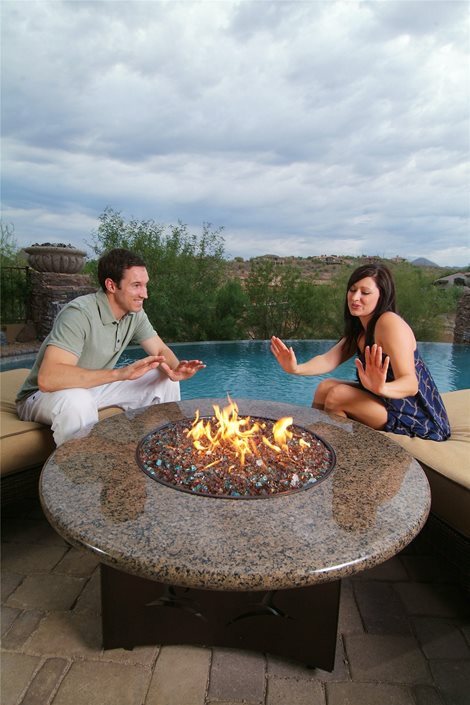 An Oriflamme fire table comes with a propane tank that is hidden in the base of the table. Most homeowners find that the can enjoy 10 to 12 hours of a smoke free flame on just one tank. If you'd like to hook your table up to a natural gas line a simple conversion piece is available. Pricing for Oriflamme fire tables is dependent on the selections you make and the size of the fire table. Nielsen says a table topped with Tuscan Travertine is slightly more economical because it is a man-made material. You can expect to pay between $1400 and $1600 for this option. For a table topped with granite the price will be between $2000 and $2400. To purchase an Oriflamme Fire Table, visit your local dealer, which can be found on the Designing Fire website. The tables are also available for purchase online through All Backyard Fun.